There are 18 reviews of Acqua Viva. Great citrus scent. The cedar and cypress smell more realistic and are enchanting compared to the synthetic smells of many fragrances of this type. In some ways this is one of the best wood smelling fragrances on top of the citrus. This is disappointing especially in light of its very promising beginning. First 15 minutes is a spicy citrusy lemony fresh masculine smell. A very classy all season wear anywhere fragrance. Very quickly it dries down to a generic damp grass with a component reminiscent of vetiver. Wishy washy. Perhaps it is the reaction this has with my skin type as a lot of the reviews praise this and it was recommended to me by one of our fellow senior basenoters as the archetypal citrusy fragrance. By far the best of this type of fragrance is Guerlain's L'eau Boissee. It is not only much better in every sense but also cheaper. I almost bought a bottle but that wishy washy component is still there as well. If Profumum was not so expensive it would be a neutral . Considering the price thumbs down, don't waste your time and money. Photorealistic lemon, followed by a lot more lemon, followed by woods. The lemon is rich, zesty, two-dimensional and very tenacious. It does have a green 'feel', maybe simply because of the lemon and woods? It does smell high quality throughout, despite being a little synthetic in the base. This maybe for you if you are looking for a concentrated citrus. It's not for me because I find this style of fragrances to be boring after a while, and it's also rather overpriced given what it is. It does have some similarities with Eau d'Hadrien and also Hadrien Absolu. Clearly among the best in its style, but not something for me. I love lemons, as a child I used to eat them, and I've always yearned for a fresh lemon perfume - in my teenage years (and 20's and 30's if truth be told) I fondly imagined that finding such a fragrance would make me leaner, tanned, and possessed of that French 'put together effortlessly' ease. 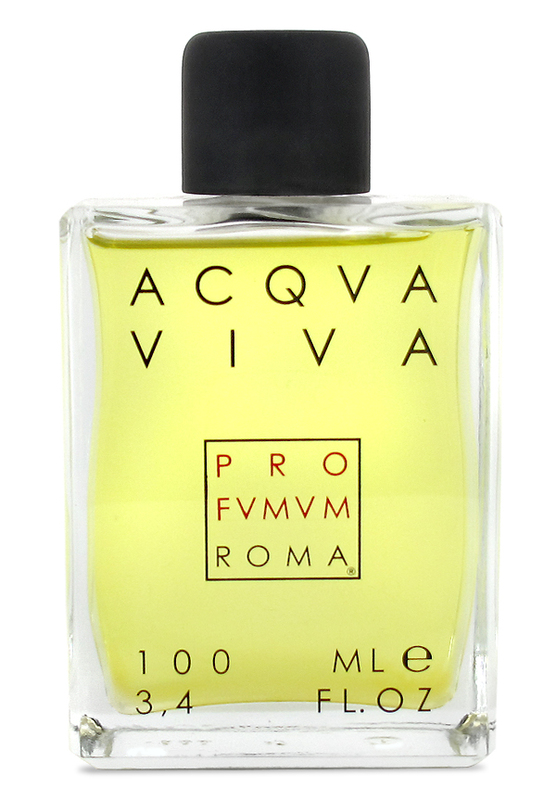 I think Acqua Viva is the closest I've ever found to my dream of real lemons, and it lasts better than other colognes. I love the fresh burst of lemon when I spray, and the other notes complement it nicely. It really feels like the zest as well as the pulp, that lovely back of the nose hit, and the flavour through the bitterness - AV is not very bitter but doesn't have the cloying sweetness I sometimes get from lemony colognes, for which I blame verbena! I bought a bottle (at full price!) and thought I'd reached citrus Nirvana. And it is nice to spray on a summer day or even in winter for a bit of olfactory fantasy (olfantasy?). It is also somehow deeper than most citrussy scents, and has some heft - it feels oily when splashed. However, it is more of a scent photo than a perfume, and, after investing in it, I amazed myself by not wearing it every day. I spent years looking for this zenith of citrus sharpness, and in the process have somehow come to appreciate other ingredients and more complex, richer perfumes. But it is gorgeous to spray mid-afternoon for an instant pick me up! As the hype has indicated, I agree that Profumum Roma Acqua Viva is among the best fresh lemon scents that I've ever smelled, or could smell, apart from perhaps a sweet lemon scent along the lines of Dua Fragrances Vanilla Lemon Gelato or Chanel Allure Homme Edition Blanche. But as far as a strong lemon presence and not too much mixed in, Acqua Viva takes the cake as the best fresh lemon fragrance I can name. It involves, overwhelmingly, fresh lemon, both the juice and the peel/rind, blended with the yellow flower laburnum, and woody notes of cedar and one of my favorite woods, cypress. It doesn't develop much, which is actually nice because the opening is so pleasant and bright. Performance is solid, more up to the par set by much of the rest of the line, with great projection and longevity. The only pitfall is that paying the standard $250 for 100ml Profumuma Roma price for a citrus-dominant fragrance seems unpalatable, but considering that this is balanced enough to be a versatile performer in not only the warm weather, but due to its strength, the cold weather, the price could be right. I'll have to consider splurging for this one---next year, perhaps. As everyone else has said, this is an absolutely beautiful fresh lemon fragrance that has a brilliant opening! I love the freshness and it makes me feel happy when that blast of lemon hits my senses. I must admit however that I expected a bit better longevity based on the reviews I've read on this one. I moisturized my skin before applying, to give this the best chance at longevity, and I just had to re-apply because it had disappeared completely after lasting about 5 hours total, and the last hour of that was such a close skin sent that it was pretty much non existent. I was hoping for the 8 to 10 hours I've heard some have gotten, especially for the price. This stuff isn't cheap, in fact it's overpriced if I'm going to have to keep re-applying throughout the day. I was also disappointed to see that the bottle is a splash, with no atomizer included. They do have a cool little roll on bottle tucked down inside the box that you can put some of the fragrance in to carry around for travel, but it's empty. :( For the price of this fragrance, I would have a appreciated that little roll on bottle being full of juice as well. Having said all of that, this really is a special scent, and I'm enjoying it immensely. It is far and away the best lemon fragrance I've ever smelled, and it brings positive feelings when worn. Because of the beauty, the smile factor, and the obvious overall quality of the product, I still give Aqua Viva a thumbs up. help me decide ---Costa Azzura & Millisime Imperial OR Acqua Viva by Profumum ?